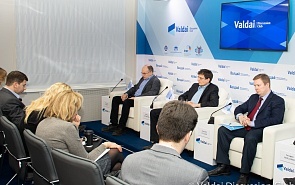 On March 21, 2019, experts from the Valdai Discussion Club met with students from the Moscow State Institute of International Relations (MGIMO) and the Fletcher School of Law and Diplomacy (Tufts University, USA). Timofei Bordachev, Programme Director at the Valdai Discussion Club, Vasily Kashin, senior research fellow at the Russian Academy of Sciences’ Institute of Far Eastern Studies, Yaroslav Lissovolik, Programme Director at the Valdai Discussion Club, and Dmitry Suslov, Deputy Director at the Center for Comprehensive European and International Studies, National Research University Higher School of Economics, Moscow, shared their views on a wide range of issues regarding the development of China's Belt and Road project. In particular, they discussed the economic, demographic and transport problems connected with Eurasian integration. The meeting was held as part of a joint educational program for Master's Degree students, organized by MGIMO and the Fletcher School of Law and Diplomacy (Tufts University, USA) from March 14 to March 24 in Moscow.